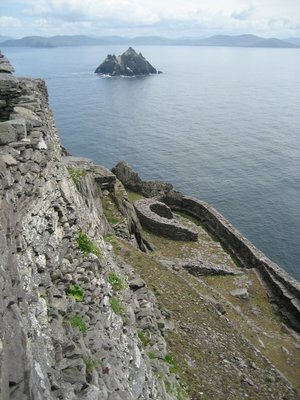 Skellig Michael. What's this "skellig?" Read on! 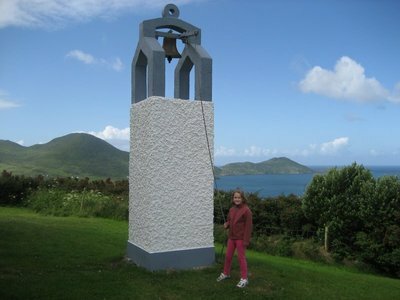 How remote is Portmagee? Well, if you were to drive to the ends of the earth, you'd then have to ask for directions by saying "how much farther is it to Portmagee?" That's not a complaint, however, because this is an amazing place. 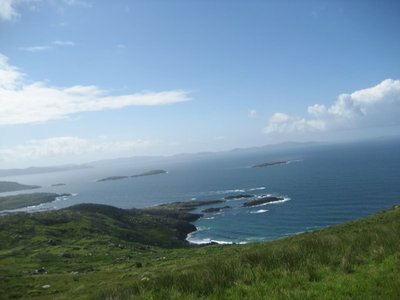 To get here we've already driven the north part of the Ring of Kerry. This little one-road town is at the tip of the mainland. We're not even in town, but a kilometre down a single-lane road in a little semi-circle of holiday cottages. The horizon out our back window is the green hill several kilometres away. 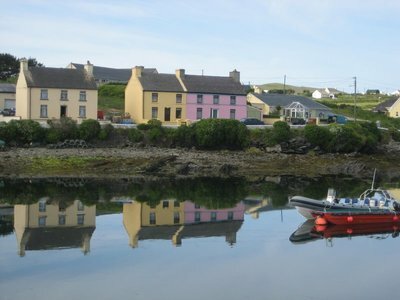 Portmagee has a bridge to Valencia Island, which is where the trans-Atlantic signals were first sent to Newfoundland in 1858. In other words, this is about as close to Canada as you can get if you don't want to cross an ocean. The drive here took about six hours. Sherry followed our silver car the whole way. Or at least a silver car. Somehow we stuck together. We stopped in Adare for lunch and for the girls to run around a park. Adare is a "tidy town", whatever that means. Tonight, our first night here, we had the turf fire going. There's a huge pile of turf in the backyard, so we've got all the "sods of turf" we'll need for the week. The weather doesn't look good. Boats won't go out to Skellig Rock if the sea's rough, and the rain is coming in. But the fire's going strong tonight. Never give up on the weather in County Kerry. Not when there's eighteen hours of daylight. We watched it pour down rain from a unmoving grey sky until mid-afternoon. Finally, we drove over the bridge to Valencia Island and went to the (indoor) exhibition centre called "The Skellig Experience". After learning about the Skellig Islands (which we hope to visit as soon as weather permits), the rain was easing off enough that we decided to drive the length of Valencia Island and check out what they call the "Tetrapod Trackway." Rocks by the shore bear the footprints of a 365 million year-old creature that was practically our first evolutionary ancestor to come out of the water. Sounds great, but it's not much to look at. It's no more exciting than seeing cat prints in concrete. Maybe less. Is a tetrapod, like, three juice boxes? By the time we drove back to the mainland, the sun was shining. Change of plans! We drove the Skellig Ring, a smaller route very close to Portmagee, with signs that say "No coaches." As in tour buses. We stopped for dinner in Waterville, parking near its inexplicable statue of Charlie Chaplin, before looping our way back to Portmagee to call it a day. We went down to the pier this morning and talked to "Pat Joe," one of the boatmen who will take you to Skellig Michael. "Unless you're only here today," he advised, "you should wait until tomorrow or the next. It'll be pretty choppy and we may need to turn back." What else could we do but trust the captain? 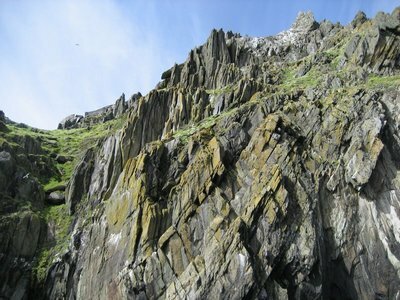 Fourteen hundred years have passed since the monastery was built out on Skellig Michael and it's still no easier to land there. No, Anica! That's not the kind of ring they mean! 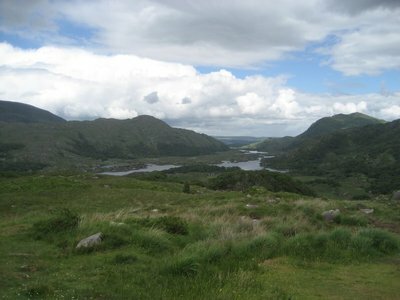 But the weather was good enough to drive the famous "Ring of Kerry." We made a beeline for Waterville, and picked up the road from there. As we made our way around the ring, I started to think that yes, this is indeed the most beautiful road we've followed anywhere in the world. Years ago, Jenn and I drove down Highway 1 in California, and there's some similarity to that, but the Ring of Kerry has more variety. At times you're down at sea-level, other times high above it. The road also cuts inland, and you see green valleys and majestic mountain gaps. The hills seem carpeted in green, all the way up and over the summits. There are all kinds of places to pull over and take in the view. Unfortunately, Anica was getting so overtired that she wasn't able to act reasonably. We said she had to either rest up or start behaving, or she'd miss out on the evening out in Portmagee. She couldn't manage either, so Jenn volunteered to stay at home with her. It was the first time in our whole year of traveling that it's come to that. Anica settled down once the decision was final, and probably had a nice time with her Mum and a good sleep. 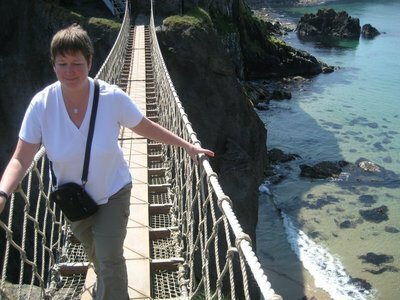 Meanwhile, Sherry, Julia, Jaclyn and I went out to the Bridge Bar in Portmagee. It was "The Turas," or "Irish Night" in Portmagee. I didn't get that: isn't every night Irish night here? But it was a special mid-summer celebration in the tiny bar. There was music, dancing, singing, and most of it by local people who were enjoying the open mic. The girls all got invited to learn an Irish dance, but only Sherry was brave enough to accept. She wasn't expecting the dance she'd just been shown to go faster and faster, but she kept up. All the time, I'm urging Jaclyn: " take pictures! Take video!" We were able to walk home from the bar, and didn't even need the flashlight even though it was after ten o'clock. So glad we waited! Today was great weather for a trip to Skellig Michael. The ocean was calm, although still choppy enough that the girls squealed like it was an amusement park ride. At least, until Jenn, Anica and Jaclyn started to feel a little seasick. The island is, after all, eight miles out into the Atlantic. When we docked at the towering rock, the next challenge was the climb. Six hundred and fifty steps. Jenn and Sherry's fear of heights had not vanished after conquering Diamond Hill last week. 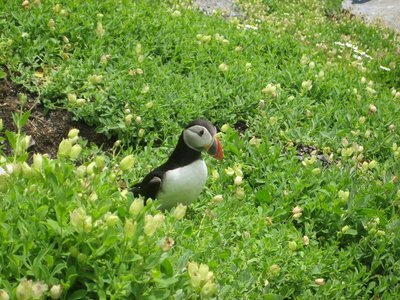 At first, we were distracted by the many puffins. They took off, landed and sat comfortably on the mossy-green sides of the island, just inches away from us. Eventually, all six of us made it to the top. 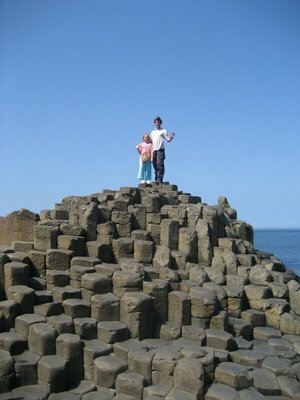 We even did it with a fair amount of style, as we saw whole families crawling, rather than walking, up the irregular stone steps, which were laid by monks in the early Christian period of Ireland. Many others were dropped off by boats, and then just looked around the island down by sea-level without climbing a single step. The purpose of climbing to the top, other than to enjoy the views, is to see a remarkably well-preserved monastery from about the 6th century. How did they built it? How did they not starve? The island is so inhospitable, and so far from the mainland, that it boggles the mind. 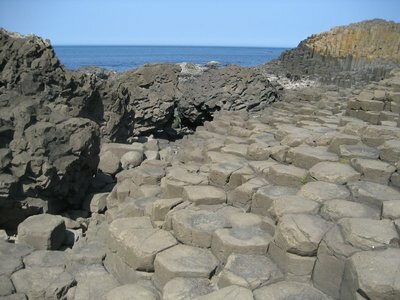 What's left are the "beehive huts," made of stone and so named for their shape. You can step inside, and imagine what it would be like to live or pray or cook inside them. There's also a stone cross (talk about the "old rugged cross"....), cisterns, what looks like a graveyard, and the walls that enclose this sky-terrace. I love the combination of a stunning natural setting and history. Other than Petra, the "Skellig Michael" trip was probably my favourite place in the world that we've visited. The boat trip on the way back didn't seem as rough, and nobody felt queasy. Just sleepy. 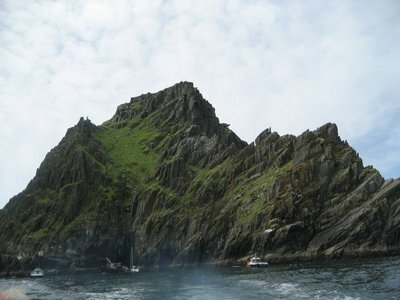 We passed close to "Little Skellig," an equally jagged island of rock just covered by birds. 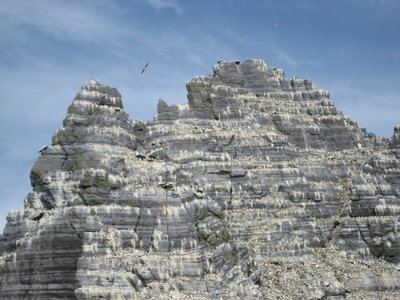 It's a massive gannet colony: a black rock covered by white birds and white bird poo. We could smell it from the boat. Pop quiz: why are those rocks white? 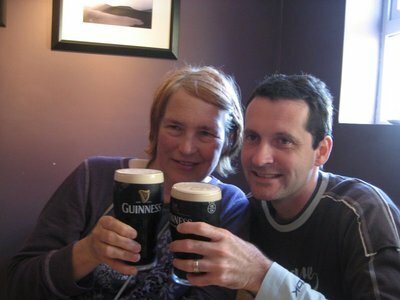 We once again ate at the Bridges Bar in Portmagee, once again walking there from our cottage, with Sherry and I once again enjoying our Guiness. At 10:30 tonight there was the pinkest sunset I've ever seen. Ireland has definitely been one of my favourite countries in the world to visit. It softens the soul, hardens the arteries, loosens the tongue, and expands the mind. What more could a traveller want? Today we said our goodbyes to Sherry, Julia and Jaclyn. They're driving part of the way back to Dublin tonight, since their flight's in the morning. 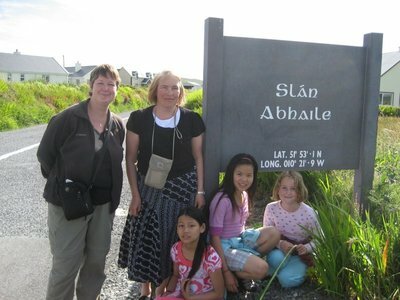 All of us drove to Tralee, and spent the afternoon there, which put them an hour closer to Dublin and wherever they might stop for the night. One of the very best things about this trip, and something you just can't plan, is how we've made good friends in one part of the world, and then seen them again somewhere else. We've been blessed with that experience both with Fred & Irith's family and with Sherry & her girls. Both families are wonderful, kind people and we've loved our time with them. Tralee, by the way, does indeed have roses. It's like they took the song lyric literally and decided to live up to it. We walked through the rose gardens, let the girls exhaust themselves in the playground, and spent time in a town square listening to a pipe band competition. You might associate bagpipes and kilts with Scotland, but there's quite a tradition of it in Ireland, apparently. For dinner, we couldn't resist going to a fancy Mexican restaurant. What is it about Mexican restaurants on this trip? I guess it's usually a change from the local cuisine, like it was in Chengdu, China. This one in Tralee was pretty good, too. There were hugs goodbye in the parking lot, and we tried to point Sherry in the right direction. In all the excitement and picture-taking, our camera got knocked to the ground and is broken. We'll use Anica's for the last two weeks instead of trying to replace it right away. Just two weeks left! Are we getting careless? I lost my watch last week, so I hope we're not falling apart just before the finish line! Today we went to Skellig Experience. It's a exibhition all about Skellig Michael. I liked the movies and dioramas about people building the monastary and the birds. The pictures about the Vikings were cool too. We then went to Tetrapod Trail. The only thing I liked was walking and the sea. We then walked back to our car and drove around the ocean and Skellig. We stopped at a chocolate factory and played girls Indiana Jones and the Kingdom of the Crystal Skull in Waterville before having dinner. Went home, played Nintendo, had my shower, storytime, G.N. Today we drove around a lot. We went from viewpoint-viewpoint-fort-lunch-Muckross house-home! 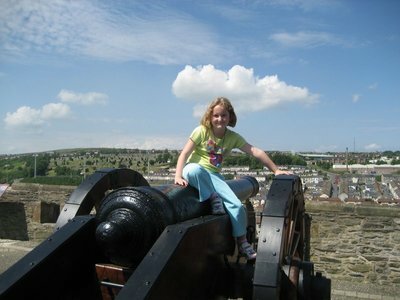 The viewpoints were cool but windy, the fort was so cool. At lunch we had 1 cheeseburger for Jaclyn, 1 chickenburger for Julia, and a quarterpounder for me. Muckross House - we only saw the gardens! We then drove all the way back to Cahirceveen from Killarney to get our grocireis at Eurospar. Then we went home. D, J, J, S went to the bar, M, me - soup, Pringles. Found an earwig in my toothbrush container that had gone poop on my toothbrush, G.N.! Today we went to Skellig Michael. We went by boat and there was lots of waves but even though I was having fun and I had took my gravol pill I was motion sick. I was very happy and so was Jaclyn and Julia because all the way up the 600 stairs we saw puffins. 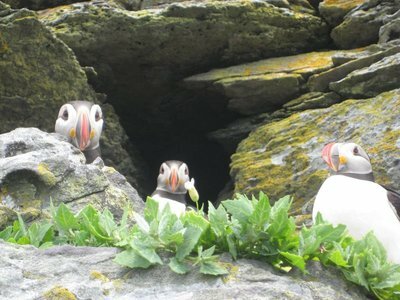 Cute, little puffins. It was very tiring so when we got to the top we didn't look at the monastary much we just sat and talked with a 8 year old girl called Lizzie. We ate snacks and rode to Little Skellig where we stayed on the boat but saw birds. Went back home, played nintendos and drew, had dinner, went home, played barbies, played boggle, played barbies, G.N.! Today at home me and Julia and Jaclyn played nintendoes. But something happened and I lost my kittys Abigail, Andrea and Anniya who were my pets on PurrPals But we bought the same kind and called Abigail with different markings. We then played barbies, had lunch and went to Tralee. We watched bands, went to a playground. Had dinner, our camera (not mine) dropped, had a very sad goodbye, went home, G.N.! 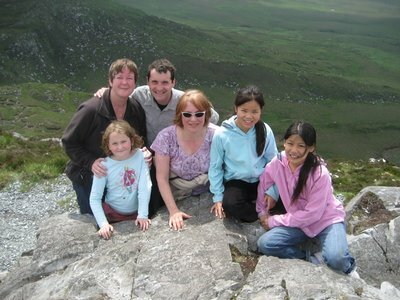 These next two weeks in Ireland we'll be spending with our friends from the state of Washington whom we met in Vietnam. If that sounds confusing, see our blog entry from Hanoi. 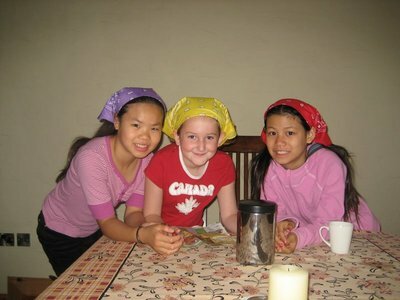 Sherry adopted her daughter Julia from China, and her daughter Jaclyn from Vietnam. 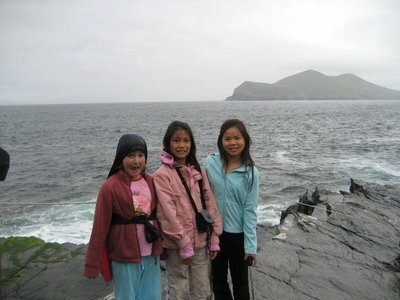 Julia's now 11, and Jaclyn 10, and since we all got along so well in Vietnam, they decided to join us in Ireland. Like Sherry says, I have to be careful what I write since "that crazy American lady's here now." The first indication we had that they'd made it was a call from their airline telling us they'd "found their luggage." At that point, we'd arrived at our cottage in Galway and were waiting for them. Before long, Sherry and the girls came to the door, with just the clothes on their backs, and we were able to say "Hi! Welcome! And guess what? Your luggage will arrive by taxi in the morning!" We were thrilled with the place here. We're in a town called Oughterard in County Galway. The house is beautifully decorated, and brand new (although when it comes to the fireplace, it's fueled by good old-fashioned Irish peat bog "turf"). It looks like this little house from the outside, but inside it's huge. There's three bedrooms, but all three girls have piled into one bedroom's queen-sized bed for that sleepover effect. Pouring rain greeted our friends on their first morning in Ireland. We took our time in the morning, and eventually went out anyway in the afternoon to a couple of nearby sites. We saw the Glengowla Mines, closed since 1865, which once mined silver and lead, and got a nice tour there. Most of it took us out of the rain, although we also encountered the "midges" which made us forget all about the mayflies we encountered last week. We also went to Aughnanure Castle, which is only a couple of kilometres from where we're staying. 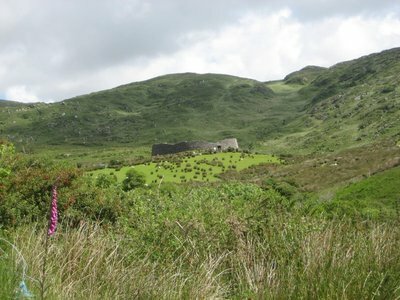 It's a 16th-century "tower house" of the O'Flaherty family, who apparently were "chieftains" living outside of most recognized laws. The main tower rises six floors, and the higher you go, the more important the people living there would have been. The walls of the tower are whitewashed inside, and liberally dotted now by bat poop. Most buildings of the castle are in ruins; there's an impressive-looking banquet hall but only one wall now stands. The 16th century version of a "dee-luxe apartment in the sky"
With better weather, we decided to make a real day of it and visit the Aran Islands. We drove to the town where you take the ferry. 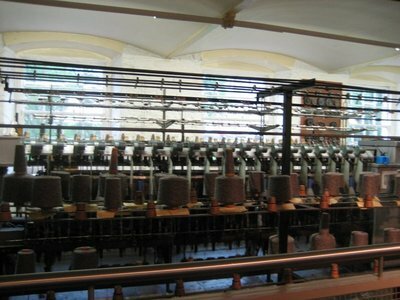 Aran is world-famous for its wool sweaters, but, other than a store that sold them, that didn't figure into our day. When we got to the island, we hired a mini bus tour. 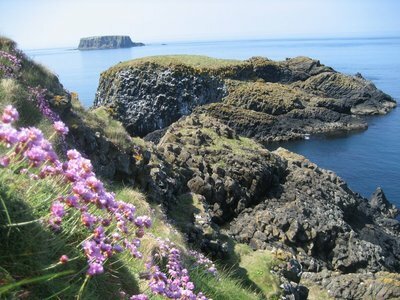 That took us all over this wild, rugged island, just two miles wide and eight miles long. I really felt like we were on the wind-swept fringe of civilization. The ground is just littered with stones, to the point that farming is almost impossible. People have piled stones into fences. Every few feet seems completely stone-fenced in. According to our guide, it's not really necessary but it's "something to do with the stones since they're there." The main attraction on the island is a 3000-year old circular stone "fort" perched on the edge of a cliff. It's called "Dun Aonghasa" (which I think is the Gaelic spelling), and it's really a series of concentric circles of stone walls (about 10 feet high and quite thick). It's from Ireland's "Iron Age" so not much is known about it, although almost certainly there were huts where people lived inside the walls. 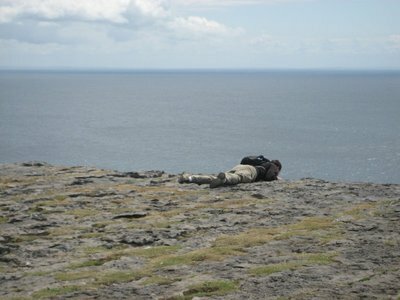 I crawled on my belly to peer over the cliff's edge: 250 feet straight down to the waters of Galway Bay. With the wind always blowing, there's no way you could just walk up to the edge and lean over. Anica, Julia and Jaclyn got to do lots of running around and screaming in the wide open spaces today (except near the cliff's edge). The mini-bus tour also took us to some other spots around the island, such as "The Seven Churches," where the ruins of three churches are still visible, and a cemetery has tombstones from this century back potentially as far as the 7th century, when Ireland's future saints were spreading Christianity to the Aran Islands. Following the return ferry, we ate dinner in a town called Moycullen, after taking a narrow, desolate road from Spiddal. Between those two towns, there was nothing but stones, horses and peat bogs. 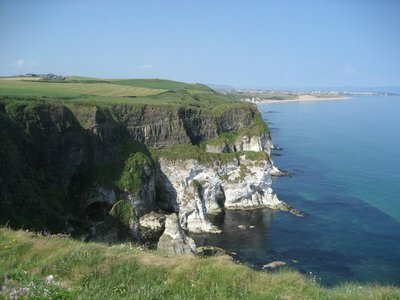 This is not the archetypal "green" Ireland, but it's undeniably beautiful in its way. The driving arrangement's interesting. With six, we need two cars, and I'm the lead car driver. We make sure Sherry's following closely. Coming out of Moycullen, we pulled over because she hadn't made the turn. We waited and waited. Finally, we saw her car in the rear-view mirror. It wasn't until we were back at the house that we found out she couldn't get up the hill at that corner. Sherry's rental car is a manual transmission, which she hasn't driven in years, and never with a right-hand drive. She'd got out of the stalling car back in Moycullen and threw up her hands as if to say "what can I do" until another motorist volunteered to drive her car up the hill. "You might want to get in," he'd said to her. Perseverance. Courage. Athleticism. None of it mine, of course. What a day! 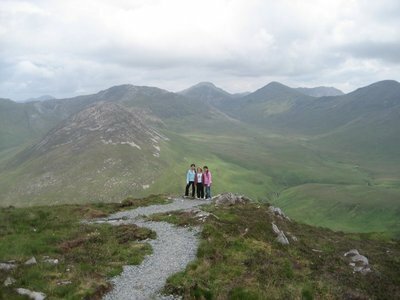 Today we went to the Connemara National Park and climbed a mountain. Technically, we walked up it, but it was still the hardest trail they have. It's 3.7 km long, and the mountain, called Diamond Hill, is 445 metres high (about a thousand feet). Jenn and Sherry are both afraid of heights, so they get the "courage" award. They made it, although Sherry didn't exactly take in the view at the summit. Meanwhile, the girls had been practically running up the hill. Anica soon tired, but then got her second wind. She gets the "perserverance" award. A parks worker was cleaning the trail and as I passed him, he pointed up at the girls, saying "I wish I had their energy." "It's just youth," I replied. "Youth," he said. "Is that it what it is? Well, 't won't come again, then." I caught up to the girls near the top, where it was getting pretty windy. We had to stay low and keep our weight forward. We got to the top, where the little stone pile marks the peak, and waited. Ten or fifteen minutes later, the Moms appeared, to the sound of our applause. What a view! I'd asked the parks worker, about halfway up: "What's that body of water?" "The sea," he said. I pointed in the opposite direction. "And that water?" "The same," he said. It wasn't until we were at the top that you could see how what looked like a series of lakes were really just inlets and bays of the sea, which filled 180 degrees of our view, several miles in the distance. Back, back, back...ok, stop! Stop. Right. There. No...farther. The drive to and from the Park was amazing. There are no scenic routes in Connemara. This is the wild west of Ireland: they're all scenic. (Literally: every Connemara road in our road atlas is highlited in green as "scenic drive"). We rode alongside lakes, weaved in and out of mountains, rocky farmland and peat bogs. At one point, we turned a corner and saw this beautiful beach. We decided to stop. Turquoise water, white sand, crescent-shaped...everything you'd want in a beach, except of course it was too cold to swim! Both the water and the air. It was probably about 19 degrees, but with a chilling wind. 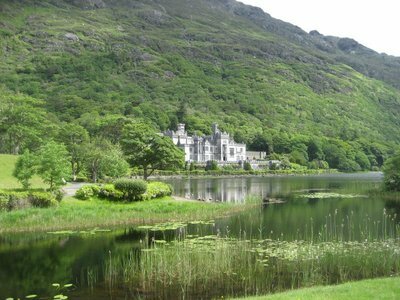 We wound our way around Connemara, stopping in Roundstone where they make the Bodhran drums, before eventually returning to Oughterard for a dinner at an atmospheric pub. It's been one of the best days on the whole trip. Completely worn out, Anica rebelled against the sleepover arrangement and ended up in our room. In our bed, actually. Then Julia and Jaclyn decided they'd go to their Mom's room, so one of our three bedroom ended up completely empty for the night. After our huge, exhausting day yesterday, we took things a little easier today. 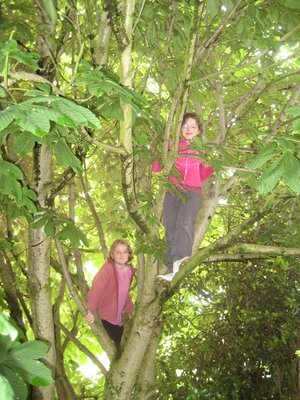 We did go out to a place called "Brigit's Garden" nearby, which our three girls enjoyed. 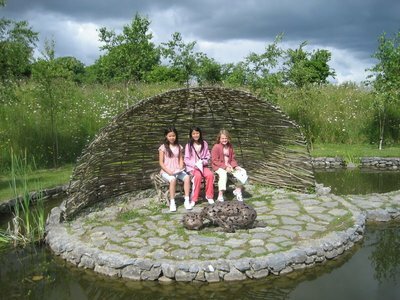 It's a newly-built Celtic-themed gardens, laid out with imaginative decorations like basket swings, and a grotto you can call into using "whispering tubes." They liked running around in the gardens and nature trail, and we also had our lunch there. Then it was back to the cottage, where I laboured to get the peat fire burning ("I'll just throw some more sods of turf on the fire!"). Sherry brought a book of Irish legends and each night so far Anica's been reading a bit of it outloud to Julia and Jaclyn. That's a new twist on our bedtime story routine! Here's what you do when you have a "home base" accommodation from which to explore an area: make a day trip by car, cover about 300km in total and take in a selection of natural and historical sites. That's what we've been doing throughout Europe, and today we had a classic day trip. First it was the "Cliffs of Moher." Anica wanted to know if they were "world-famous." Yes. Not Niagara Falls or Taj Mahal famous, but yes. 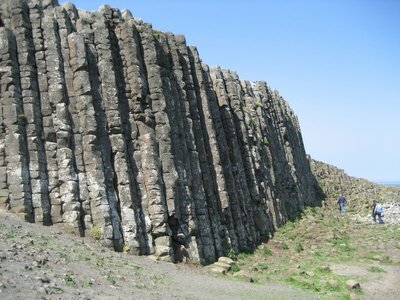 Famous enough that they now keep the tourists back from the eroding and dangerous cliff edge with a tasteful stone barrier running along a wide, paved walkway. Many ignore huge signs, such as "Extreme Danger," or "Private Property," etc. 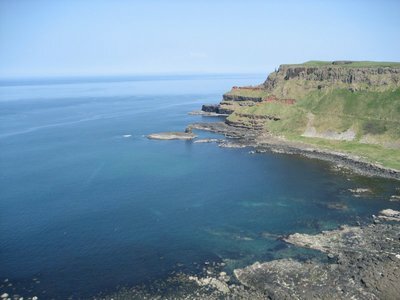 and get right out to the edge of the 650 foot high cliffs. Jenn and Sherry were happy to obey the signs, and glad that I set a good example for the kids, too. 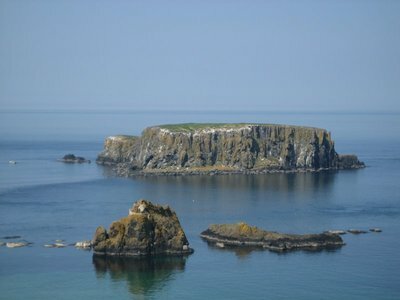 It is a beautiful and dramatic set of cliffs and coastline, with some distinctive features, such as the "Hag's Head" (which I couldn't pick out), or the "The Stack," which looks like it's calved from the mainland. It's not thrilling, though, just pretty. 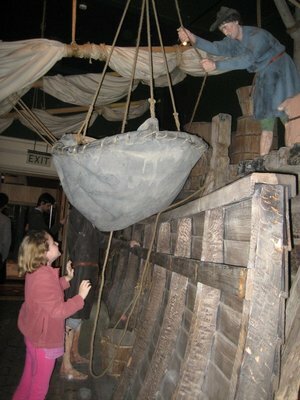 The girls liked the "Atlantic Experience" in the Visitor's Centre just as much. They have a three-screen video setup called "The Ledge" that makes it seem like you're a seagull flying, or a gannet diving. After the over-priced cafeteria lunch there, we were back on the road, heading to Bunratty. 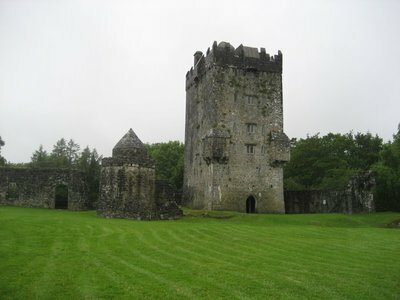 This town has the "Bunratty Castle and Folk Park." We've been to some castles, and even a "folk park" or two lately, but Sherry, Julia and Jaclyn haven't, and this is one of the best attractions in the west of Ireland. The castle was extensively decorated, with nothing past 1619 shown, and the rest of the grounds are a reconstructed village and collection of farm houses from the 19th century. The funny thing was seeing the same sort of turf-fire equipment that we have in our brand-new cottage back in Oughterard. Times haven't changed that much! What really transfixed our little girls, however, was watching three costumed women prepare a huge apple pie to be baked. They stood there for the whole process, exclaiming "cool" from time to time. "It's like they've never seen baking before!" moaned the bewildered Mums. You shall have no pie! 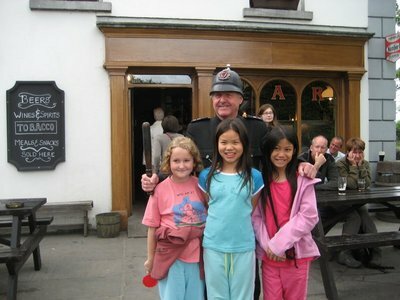 Arrested at the Bunratty Folk Park. In the morning, we visited the Galway aquarium (actually in Salthill). The girls liked the manta rays and starfish they got to touch. We also liked how it was focussed on Ireland/The Atlantic, so we could imagine what's under the sea all around us. Then I had cod for lunch. After that, we headed into Galway City itself. Mostly we just walked around. There's a vibrant pedestrian-only area, and we had three VERY vibrant pedestrians with us, so we looked at some of the landmarks like Lynch's Castle, St. Nicholas Church, etc. As we neared the Nora Barnacle House, we made a point of seeing it. 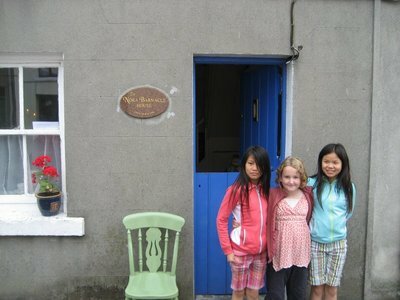 Nora was the wife of James Joyce, but really we just wanted to show the girls what her childhood home looked like. It's a preserved example of a "one-up/one-down" 19th century rowhouse. What we weren't expecting to find was a celebration! 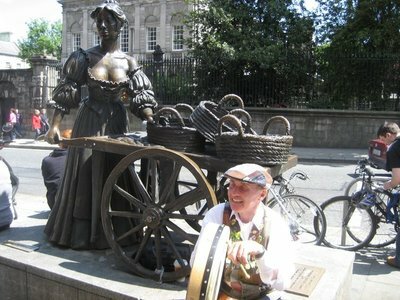 It was Bloomsday, something I'd read about when we were in Dublin, but I forgot that it's June 16th. Bloomsday celebrates James Joyce because it's the day his epic novel Ulysses (whose main character is named Bloom, of course) takes place. In Dublin, people dress as the characters and follow his fictional path through the day. The women who work at the Nora Barnacle House had baked up a storm and we were warmly ushered in. Our main hostess must have known that three girls under 12 wouldn't be big Joyce fans, but the three of us adults could at least say we've read a little Joyce back in college. There were a few other people there, and we soon realized that volumes of Joyce's prose and poetry were being passed around, and people were taking turns doing impromptu readings. Sherry was the first of us to take up the invite, then me. (Most of us preferred to perform one of his short poems...) Just as Jenn was about to give it a go, Anica said she'd like a try. She picked out a couple of stanzas, and read it out nicely. So then Jaclyn wanted a turn, then Julia. All three of them gave a public poetry reading. Everyone thought that was great! Right in character, Julia walked up a couple of stairs to make sure everyone in the room could see and hear her. It was priceless. As we left the house, I was in a daze - how had that just happened? There's only one day in the entire year that we could have had that experience, and we just stumbled onto it by accident. Serendipity. Eventually (because we were full from all those home-made baked goods), we ate a place called "Couch Potatas" that specializes in, you guessed it, jacket potatoes. Lots and lots of variations on the theme. So Julia and Jaclyn, in particular, liked that. Home to pack up! We're on to County Kerry tomorrow! Today me, Julia (! ), Jacyln (! ), Sherry and M & D stayed in for a bit because it was raining. I can't belive that I'm actually seeing them! It's really fun! We watched T.V., played multiplayer Nintendo and Pictochat. Then we went to the Glengowla mines. We went on a very cool tour but we could only where helmets. And too many flys. We then went to a ruined castle. We went on a nether tour where we went up lots of stairs trying to be inside. We then went back, played, had dinner, went home, G.N. Today we went to Connemara National Park. It was a very long drive. When we got there, Julia, Jacyln and I were hungary. So we had our picnic of meat, cheese, chips, and cookies and veggies. We then climbed up a very high mountin and it went like this: kids, Dad, Mums. It was really fun but hard. Going down was even easier and I and the girls zoomed downhill. We then drove around for a bit before coming to Roundstone - Recess - Maam Cross - Oughterard. Had dinner, went home, G.N. Today we went to Brigit's garden. We started off with our activity sheet which took us all around the gardens from sundial to swinging chairs. It was everything. We climbed on earth woman, had lunch, swinged on the chairs and lots more. We then went home and played nintendo before we watched tv, then we had dinner, played more nintendo, G.N. Today we went to the Cliffs of Moher. It was very fun but we think it was funny because people were passing by the private property and risk of death signs (we diden't)?! We had lunch at there restaurant after there atlantic exibithian. 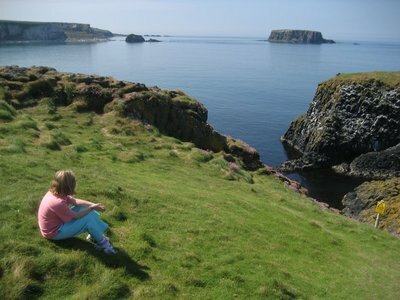 My favrite part was the ledge where you I could watch a movie and pretend you were a seagull or a fish. Then we went to the folk park. It was very fun and funny and cool because they turned the shops into modren day shops! It was very fun. I also like the playground. We then went home, had dinner, went home, G.N.! The first time we saw each other we were shocked because we couldn't beleive that we were in Ireland. We spent alot of time until we had to go to bed. Then we went to this mine place and then we went to a castle and looked around. There were lots of stairs. We came home and played and talked and then to bed. After that we went to Diamond Hill then a beach. Diamond Hill had lots and lots of steps. They were stone steps. The beach was really clean but then we saw a big pile of junk. It was called Dogs bay. And then went home and went to bed. 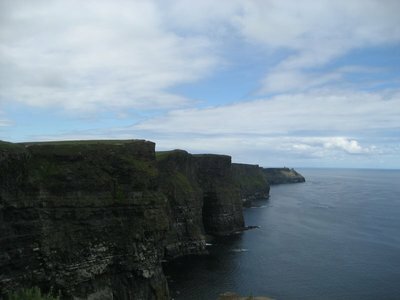 Then we went to the Cliffs of Moher and we saw alot of cool awsome exciting things. This trip has been really cool, aswome and exciting! 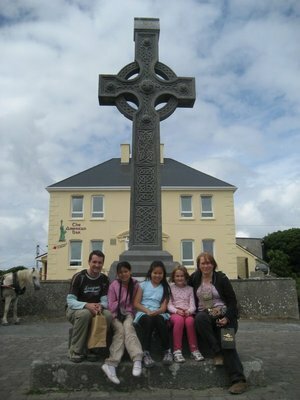 First we, my sister and mom and me, flew to Ireland to see Anica! The first day we went to Glengowla mines. After the mines we went to a castle to look at. When we done looking at the castle we went home. The next day we went to clime Diamond Hill. Diamon Hill was about 1,000 feet high. But before Diamond Hill and after the mine & castle we went to Aran Island. Then went to Diamond Hill the next day. We stopped at a beach called Dogs Bay. After we left Dogs bay we went to Roundstone and went to Spiddal. And after all that it just keeps going! Today we went to Galway and Salthill. The first thing we did was go to Galway Aquriem. The first thing that was really cool was a tank where it would be really quiet and then all of a sudden a wave would come down on the fish! We saw Manta Rays, Babys, movies and lots more. We also got to pet. We then went to lunch which was called Salt and Pepper. Then we walked all along the pretty streets of Gaway and walked into a museam. 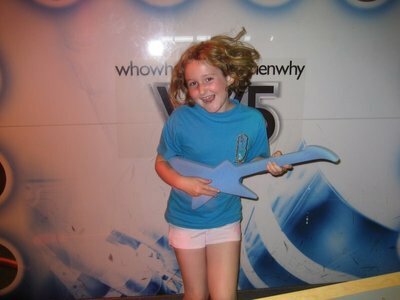 Then we dizzied our selfs around on the thing (in the playground) and then we went to Couch Potatoes which I just had garlice bread because I was feeling sick and dizzy. Went home, G.N. We're going to take it pretty easy here this week. First of all, Jenn needed some time to recover from her head injury. She seems okay, but it definitely was hurting the next day. Secondly, we need to conserve money and energy in order to make it through this final month! 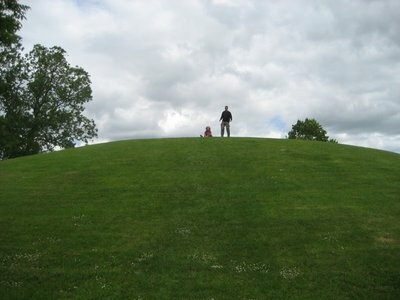 On the way from Northern Ireland, we stopped to stretch our legs at Navan Fort. It's a iron-age Celtic site, but the "fort" itself is long gone. What's left is a circular grassy mound with a grassy trench running around it. Even that's only visible because it's been excavated, and they know shockingly little about it. But it's indisputably a place of Irish kings who people the ancient song cycles. Having headed south from Magherafelt, weaving in and out of the open border (noticeable only because of speed limits changing back and forth between kilometres and miles), we are now in the Republic of Ireland. Where we're staying really puts the PUB in republic. We're in a converted barn in back of a pub in a village called Multyfarnham. Their smokers' patio is right outside our back window. No buffer zone, but luckily it's been quiet. Most people come to the pub for a meal, although last night there was traditional Irish music in the front bar, and I went over to listen and have a pint. The owners here are really friendly, and - great for Anica - have two daughters aged six and three. Anica's been playing with them every day. The property is several acres, including a big lawn and a wild meadow beyond that. Multyfarnham has a tiny main street with a general store and one other restaurant/inn, plus a "Victuallers" (took all our etymological skills to guess what that was). It's 10 km from a much bigger town, Mullingar, and less than an hour's drive from Dublin. We went into Dublin yesterday, although not for a long visit because the rain came. We've been getting the changeable Irish weather we had expected this week. What we did do in Dublin this time was have lunch and visit the Chester Beatty Library. 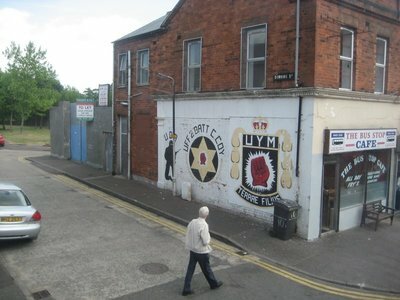 This was my must-see for Dublin, along with the Book of Kells. What a great city for bibliophiles! Beatty amassed perhaps the greatest private collection of books in the world, and left it to the Irish people. It's free to visit this museum, which is good because parking was about three Euros an hour in Dublin's "fair" city. Beatty preferred illustrated books, such as medieval illuminated manuscripts. Even more so he preferred Eastern texts. We saw amazing centuries-old Japanese and Chinese scrolls, Mughal writing illustrated with miniatures, Korans as old as a thousand years, and the earliest Gospels (fragments from all four, dating to the second/third century). In fact, the second floor is called "Sacred Traditions" and is organized by religion. Anica was enthralled (for a while) and also liked the computer videos on book-making, printing, engraving, etc. By the time we were done, that was pretty much the afternoon gone. We'll be back in Dublin at least once more. Today we were indeed back in Dublin, after a rainy day around the house. We went to Dublinia, a perfect cross between tourist trap and museum, where we learned about medieval and Viking-era Dublin. Including even the fun of throwing stuff at a mannequin in the stocks (if you hit him in the nose, he told you why he was there...I don't think the real stocks were as much fun)! A man who looked convincingly Viking-like showed us the making of clasps for clothes and of silver coins. Then it was on to Trinity College and the Book of Kells. There's a good build-up to seeing the actual book, which, for Anica, was inevitably disappointing. Perhaps she thought it would be a giant book. Since it was Saturday today, the Temple Bar area was in full swing. We had a somewhat lacklustre walk through it, with its street performers and stalls. 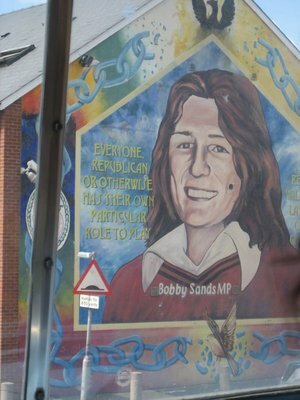 We also walked past the Molly Malone statue (aka "the dish with the fish," the "tart with the cart") and the "Spire," a 120 metre tall modern landmark on O'Connell Street (aka, and now I'm only guessing here...."the prick in the brick," or...what rhymes with rock?). When we got back "home," Anica started playing with Eleana and Donna again, and got invited for dinner (cooked by the chef and eaten in the pub, mind you) and spend the evening with them. Una said she'll have her back "by eleven" and sure enough, at 11:00 PM Anica came to the door and said "Dad, can I please stay and finish watching High School Musical 2 with them?" I think it was the first time I've waited up for Anica to come home. They'll be lots more of that in the coming years! We had the Sunday lunch in the pub today. That's their busy day, with a three-course carvery menu. Jenn and I both had the Prime Rib with Yorkshire pudding, etc., and for dessert both picked the Caramel and Toffee Cheesecake. To call it pub food would be misleading, their food borders on gourmet. 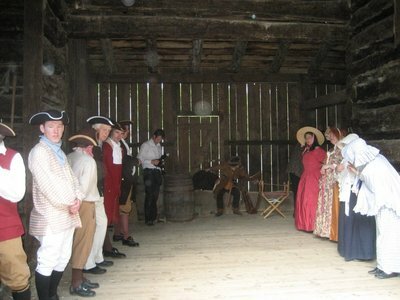 Then it was off to a country fair, the "Multyfarnham Field Day." We looked after Eleana, and other friends of the Weirs took care of Donna. We watched them in the bouncy castles, and getting pony ride, and looked at all the other events like the dog show, the baby show, cow-milking race, mouse race, horsehoes, etc. 1) Of all the days so far we've been here I played on stones, swings, gardens, houses, construction sights, and lots more with their girls Eleana and Donna. 2) I think our place is very old-fashined because it has wood toilet seat and walls in the washroom. 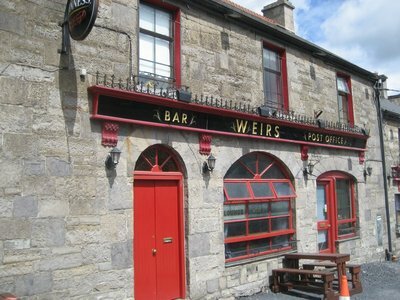 3) It's behind a bar called Weir's! 4) One of the days we went to Dublin. It was raining so we only had lunch and saw a library/museum full of lots of religious things! 5) Two of the days so far we rested. 6) We got to Mullingar to get all our groceries at Tesco! 7) Multyfarnham is a small but cute town. Today we went to Dublin. When we got there we parked and went to Dvblinia and the Viking world! There you could do stuff like touch and do stuff from the market. Learn how some people got in jail by throwing balls on there nose, learn about the Black Death (a plague caused by rats-fleas, fleas-human, humans-humans), and lots more! I really enjoyed it! I also learned there was no evidence that Vikings wore horn helmets, that they used rings on capes and clothes, that the Vikings were good but bad too. We had sharmaha for lunch and then we walked all over Dublin! From Temple Bar to Dame Street it was everything! We then went back to the car park and drove home. When we got home I played with the kids from 6:30-11:30! 5 hours! We played tunnel tag, dress up, and do a play, and watched High School Musical 2! Yawn, snore, Oh sorry, G.N.! P.S. I also had dinner with them! 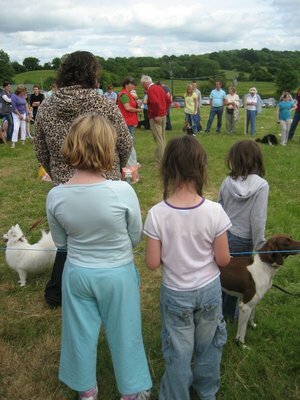 Today we went to the field day, when we got there we met Eleana and Donna. We first went on a bouncy castle where a boy younger then me kept on kicking me till I yelled at him so loud and pushed me over (!) that he moved to let me out. We then went to the ponys where we also had ice-cream and a drink. Then we went back to the bouncy castle where nobody kicked me. We then watched the dog show for a bit before going home. Then me, Eleana and Donna played for a bit before saying goodbye and having dinner. Watched some Shoebox Zoo with popcorn, went to bed. G.N! P.S. When I was wearing a tunnel and going on a swing I fell off and hurt my elbow.